When I first see this "Dried Shrimp Egg Plant" in my friend Wendy's blog, it reminds me of my hubby who is now working in Hanoi. He loves this dishes a lot. I wondered why I can't cook this dishes the same way as we always have in the restaurant. The egg plant I cook always end up too soft and tasteless. I always add too much water to cook it and sometimes got it over-cooked. Too much water makes the egg plant tasteless. Egg plant tends to absorbs a lot of oil if we deep fry or pan frying to soften them. I would like to thank Wendy again for sharing with me the tips on how she cook the eggplant with less oil and it's more healthy. Here is the recipe from Wendy. Heat up the non-stick pan without oil. 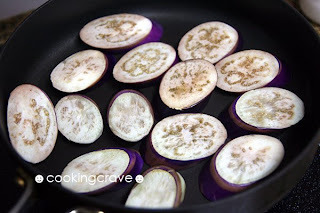 Place the sliced egg plant in the heated pan, cover with lid and cook for 2-3 minutes in low heat until its bottom part turn brown. Becareful not to burnt the egg plant. 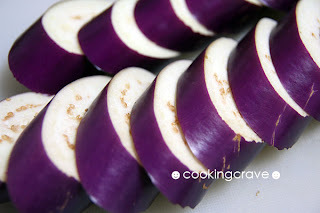 Flip the egg plant slices, it should be slightly soften now and cook for another 2-3 minutes. When both side of the egg plant turn brown, remove from the pan and set aside. 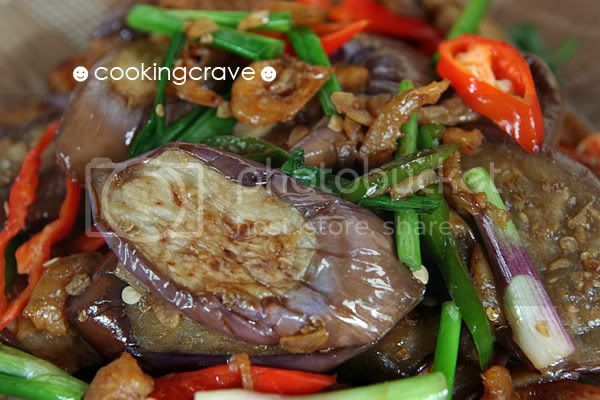 Note: Make sure the egg plant are soft before proceed to the next steps of the recipe. Heat the pan with a tablespoon of cooking oil and brown the garlic in medium heat. Add in dried shrimp and chili padi, stir and cook for 1 minute. Add in fish sauce, hoisin sauce, oyster sauce and soy sauce. 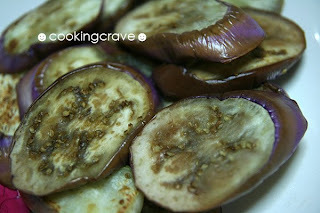 Immediately stir in the eggplant slices, cook for about 30-45 second. Add in water, spring onion and red chili. Stir until water dries up. Serve warm with rice. 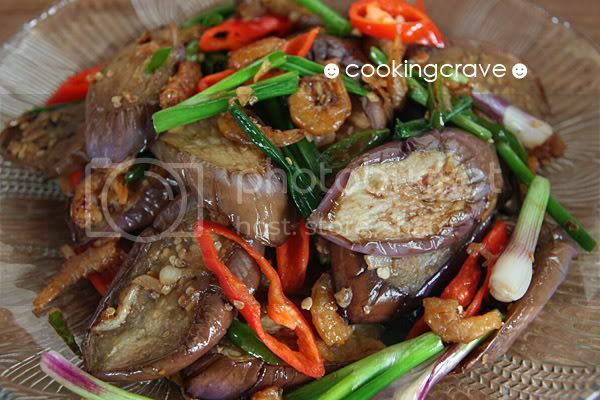 For those who love egg plant dishes, I truly recommend this recipe. A must try recipe to all of you. It's tasty and not oily at all. It smells so good that I can't control myself and straight away have one slice in my mouth. Yummy!! wow Amy i love Egg Plant alot.. thanks for sharing this! haha... , I'm glad you like it! Hi Tintin, thats nice cooking. Incidentally only this evening we had these, my wife made assam fish and had several inside. Keep a song in your heart and have a nice day, best regards, Lee.